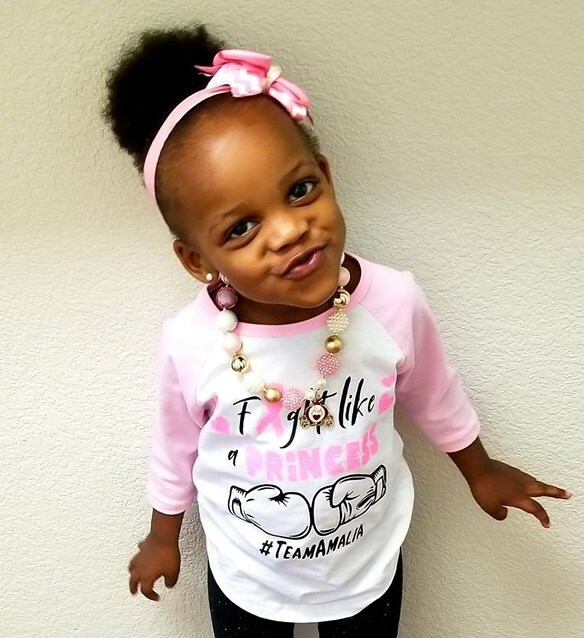 Our beautiful, energetic, sassy 2 year old daughter Amalia was diagnosed with a Wilms Tumor on Friday, September 21, 2018. The cancer cells had spread to her lungs. She didn't have any symptoms. I was moisturizing her skin, and felt a hard lump on the left side of her belly. We took her to the ER, they ran a few tests and sent us to Vanderbilt in Nashville. We had no idea that this would turn into cancer. She didn't understand why she had to stay in the hospital. She kept saying, "But Mommy I no sick!" It broke my heart because she really was sick. The tumor was 14cm ... larger than her kidney. It was causing her blood pressure to elevate because it was putting so much pressure on the kidney. We have 5 other kids at home that didn't have a clue what we were about to go through as a family. On September 24th Amalia underwent surgery to have her left kidney and the tumor removed, and a port placed for chemotherapy. Her surgery went well without any complications. She started chemotherapy on October 4th. After 6 weeks of treatments, she had a CT scan to check for progress. The tumors in her lungs had shrunk significantly, but not enough to continue her current treatment plan. Our oncologist altered the plan to include radiation and more intense chemotherapy inpatient every 3 weeks along with her weekly chemo routine. She spent her 3rd birthday in the hospital for Neutropenia. The more intense chemotherapy knocks her Neutrophils down completely, which causes her to run dangerous fevers. She successfully completed 8 days of radiation therapy and graduated with honors on December 17. She is still doing her weekly chemotherapy treatments, and the inpatient treatment every few weeks. Our doctor's are pleased with her progress and are still very optimistic that we will beat this! I am truly in awe of this little girl's strength.